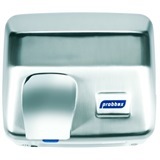 Hand dryers will offer an efficient and hygienic solution in communal and public washrooms as an alternative to paper towels which can get wasted. 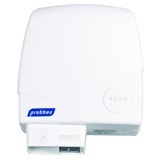 Powerful yet efficient, our range of push button and automatic hand dryer machines will give a steady stream of warm air out at an ample force for cleaning the hands or face, without being too demanding on power consumption. Utilising these products will be more cost effective in the long run, and will also stop the spread of germs and bacteria.